Indoor gardeners have a love-hate relationship with crotons. They can be finicky plants, dropping their leaves suddenly, but some are tough as nails. I once had an atrium to take care of and there were a half dozen or so of them planted along the southern wall of the atrium. The roof was glass, but the atrium was in the center of the building. The plants received no direct sunlight and were planted directly in the soil. These plants did fabulously, so much so in fact that once a year or so I had to cut them back severely to ½ their size. They loved it, coming back stronger than before. I've also had to take care of them in a retail garden center inside a home center. The conditions were less than ideal and some of the crotons did well and some of them did poorly, constantly dropping leaves. In warmer climates, these beautiful plants are used extensively on landscaping as foundation plants, specimens, and hedges. In northern areas they are mostly used in containers as indoor or outdoor plants. Crotons, Codiaeum variegatum are a marvelously varied species of plant native to Southeast Asia, where they can grow to 9 feet (3 m). They are members of the Euphorbia family. Their leaves come in a variety of shapes and sizes from narrow twisted or straight to broad ovals. They come in kaleidoscopes of colors or dark greens and red. The broad leaved varieties seem to be the most durable. 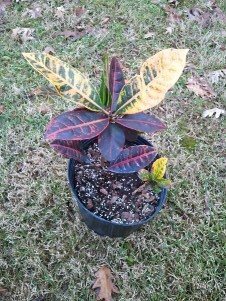 Codiaeum variegatum 'Petra' is the most commonly available. These are the ones that were growing in the atrium. They like to be in a bright sunny spot, but tolerate light shade. The one pictured here was kept inside near a window with northern light and didn't do too well, losing most of its leaves. We took it outside last spring and it sat in mostly shade with some morning and afternoon sun and it started coming back, although it was mostly ignored except for watering. We brought inside, placed it in a patio door window that gets 2-4 hour of sunlight each day and it seems to be thriving. Another popular variety is Codiaeum variegatum 'Gold Dust'. The leaves on this variety are smaller. The coloring is a bright green with yellow spots. This is another variety that does well. Codiaeum variegatum 'Mammy', however is one of those varieties that give Crotons the finicky label. They are very sensitive to watering and will readily drop their leaves. The leaves are narrow with wavy edges and have dark coloring. Give your croton a sunny spot, warm temperatures, even watering, and keep it from drafts inside and it will reward you with years of beauty.